Well folks... it's happened. After well over a year of being pretty pumped and motivated - feeling like I'm getting a ton of painting done and really stepping up my talent. After all that, I feel like I've hit a wall. I know why, a few things combined that really shouldn't have so much influence on me: Real life issues, doing badly in a contest I'd previously done well in, leaving an online community that had felt like a place to share my progress with others that shared my passion. Whining about this sad state of being is not really the point of this post however. I want to explore things to get you re-invested in the hobby. As with pretty much everything else I talk about, Uncle Atom has gotten there first (and done it better). You can see a couple of the more relevant videos here and here. So what can you do to fend off the brick wall? Hangout online - even if you aren't near other painters, you can still hang out with folks online. The Hobby Hangout in particular is a great place to do this. 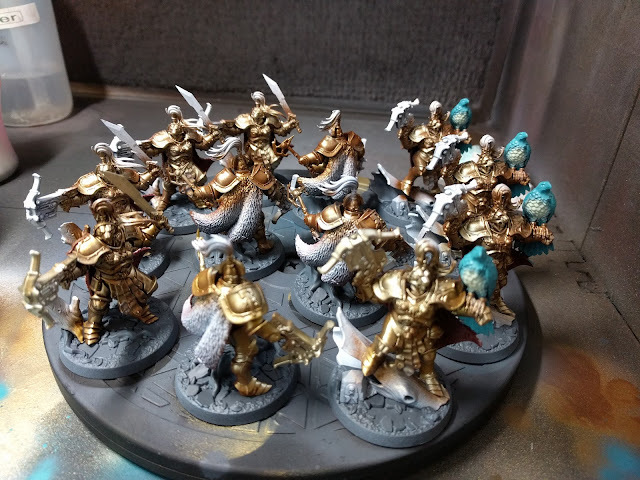 There are also a few discord channels that do the same like r/minipainting's channel that will often have others chatting. Set goals - give yourself deadlines to paint up an army or unit or miniature. Tell others about it as well so they also hold you to it. Set aside a regular time - This has been hugely helpful for me in the past, having an hour every day when I paint. Find a new project - Sometimes it's best just to take a break from the current project and find something else that you are more inspired by to get you going again. Have you got any other ways that you stay motivated?